A new study by Target Sports Marketing, based on surveys of Camp Perry competitors, provides some interesting facts. First, and this is no surprise, more than 80 percent of competitive shooters reload their own ammunition. The majority of these shooters (60 percent) compete year-round while a larger percentage (70 percent) practice year-round. Interestingly, there is a significant “generation gap” among shooters. 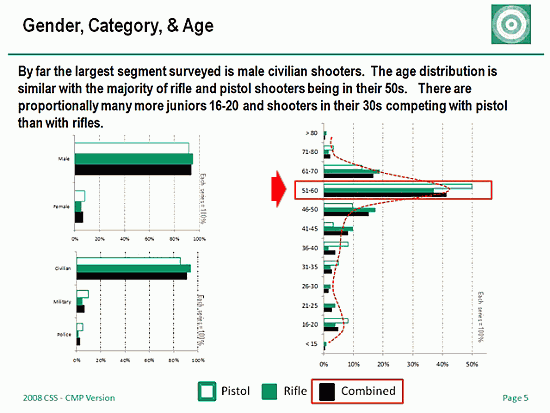 According to the survey, shooters in their 50s compose the largest segment of competitive rifle shooters. And, the combined number of rifle shooters in their 50s and 60s exceeds all other age categories combined. Keep in mind, Camp Perry focuses on traditional NRA High Power, Palma, and long-range events. Were you to survey other disciplines (such as 3-Gun Matches), you’d likely find a different age distribution. Nonetheless, the numbers do demonstrate the need to increase the number of younger rifle competitors. Unless there is a major effort to attract new, younger shooters, it appears that competitive rifle shooting could decline in popularity dramatically in a decade or so, as the Age 50s cohort gets older. The findings are based on the feedback of nearly 400 rifle and pistol competitors at the 2008 U.S. National Matches at Camp Perry, Ohio, hosted by the Civilian Marksmanship Program (CMP). 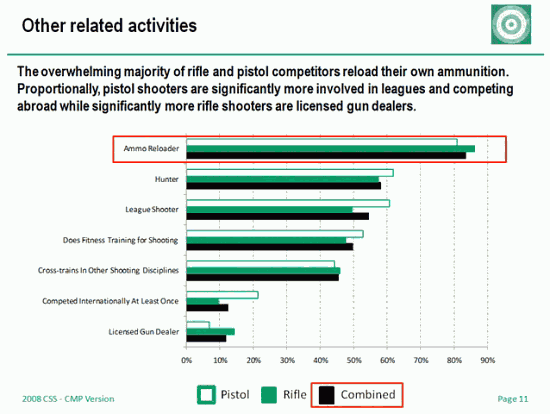 The study focuses on individual competitor demographics, shooting sports engagement and brand preferences for firearms, ammunition, components and accessories. An animated, narrated summary of the report is available at css.targetsportsmarketing.com. Definitely click the link — many interesting facts are revealed. This particular presentation focused on 186 CMP competitors, two-thirds of whom were rifle shooters. Graphs and data created by Target Sports Marketing for the CMP. Share the post "No Surprise — Older Shooters Dominate NRA Rifle Competition"
This news item comes to us via the NRA Blog. Attention all Junior Pistol and Smallbore Rifle Shooters: registration for the NRA Junior Pistol and Junior Smallbore Camps is now open! Space is limited to 50 shooters for the Junior Pistol Camp and 72 shooters for the Junior Smallbore Rifle Camp. CLICK HERE to download your paperwork, and send it in. You can also call (703) 267-1481 for more information. These camps are designed for junior, intermediate-level pistol or smallbore rifle shooters. The smallbore rifle camp has been primarily designed for the intermediate shooters. However, beginners will be accepted on a space available basis. Shooters need to be at least 12 years old. Taught by NRA Certified Coaches, both camps provide expert coaching in the fundamentals of shooting while providing a safe, enjoyable learning experience. These camps are the perfect way for juniors to improve their shooting skills while meeting other shooters in their age group. The NRA Junior Pistol Camp will be held July 14-17, 2009 at Camp Perry, Ohio. The NRA Junior Smallbore Rifle Camp will be held July 25-30, 2009 at Camp Perry, Ohio, and provides instruction in 3-position and 4-position smallbore rifle shooting. Both camps cost $175.00 for advanced registration (must be received before June 15, 2009) or $200.00 for standard registration (paperwork received after June 15, 2009). Share the post "Juniors — Registration for NRA Summer Camps Now Open"